A decade ago, when Kerala witnessed the rise of its self proclaimed “elephant lovers”, thanks to popular television shows celebrating the lives of ‘celebrity’ elephants, at least some felt more relaxed, that things would go better, with increasing number of concerned souls. However things, were not as expected, when the first decade of the 21st century witnessed rising of elephants as celebrities and stars, like never before, with a huge fan following, vehemently defending their idols. With stardom comes competitions and ego clashes, and so it happened in this case as well. What started as friendly competitions and episodic petty arguments have now turned to outrageous clash of clans, on social networking sites, and in the form of derisive hoardings and slogans, a very recent personal observation being defaming of a ‘celebrity’ elephant in offensive terms by the followers of yet another. The welfare of the animals, whose lives are supposedly celebrated, has now taken a backseat, in the adrenaline rushes of the fanatics. A hoarding depicting fanatic devotion to the elephant in the picture; the words on the left of the image in strong words portray their hatred towards yet another elephant. I grew up hearing the names of Mangalamkunnu Ganapathi, Ezhuthassan Sreenivasan and Guruvayur Padmanabhan and several others, whose lives were celebrated, not pompously and competitively like in these days, rather silently, with more spirit, in the souls of several youth and old alike, whose lives were often intertwined with those of these pachyderms. The relations were often beyond passion, or adoration, as was evident from the way the gentle giants were treated, as was evident from men who wept away their lives as the majestic animals passed away. Today, the death of an elephant is ‘celebrated’ on social media, with virtual wreaths and garlands, and by evening that day, the animal is a long forgotten story, there are other elephantine debates happening around. What caused his death, or how the problem could’ve been sorted are questions one should not ask, the standard answers being colon impaction for the former and (whispering) better management for the latter. The Wildlife Protection Act (1972) amended in 2002, posits the ban of sale, lease and any other transaction of elephants. However, contradictory to this, sale and lease of elephants have been happening in Kerala, more extensively than what used to be earlier. Sonepur Mela in Patna, Bihar, was badly hit with the enforcement of some of these regulations, as Sonepur used to be the major ‘supplier’ of elephants to Kerala. Now with restrictions in interstate transportation as well, traders in Kerala perform their transactions within the state, and an individual elephant gets traded from A to B and B to C and so on till one person decides not to sell the animal. And in spite of legal barriers in place for sale/transactions, newspaper articles and social network posts celebrate the rising prices of elephants. The second violation comes in the form of revenue gained through per day rents (yet another form of transaction) of these animals for festivals, which accounts to huge sums of money. What used to be four digit numbers started rising with demand kicking in and auctions began to happen. Fanatics auctioned Guruvayur Padmanabhan for a sum of Rs. 77,777.77 for a day at the Nemmara-Vallanghi Vela festival in the year 1999 and Rs. 2,22,222.22 for the same festival in the year 2004 which changed the scenario completely. 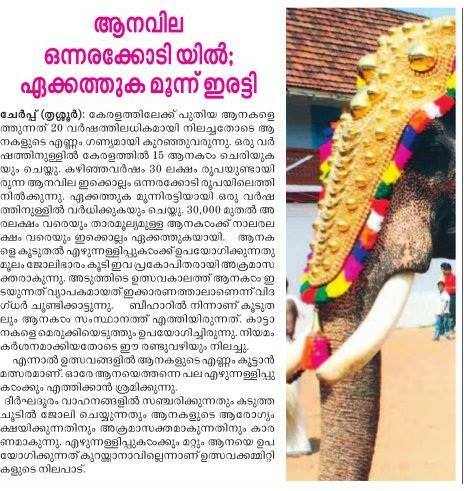 More such auctions began to take place, the latest of the bunch being that of elephant named Sivaraju owned by the Travancore Devaswom Board, for a sum of Rs. 2,60,500 for a day for the Thrikkur vela happening on the 9th of this month. 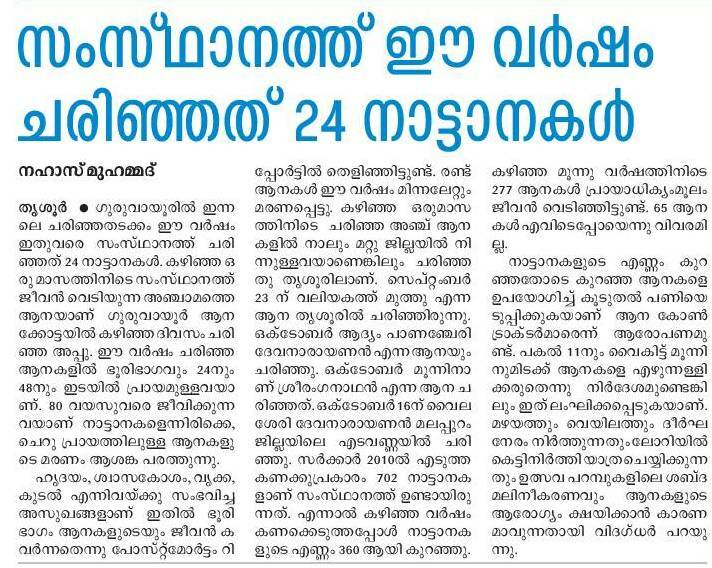 What is interesting is, in both these cases, the elephants belong to Devaswom Boards, which means that they are owned by the Government establishments and not by private individuals. 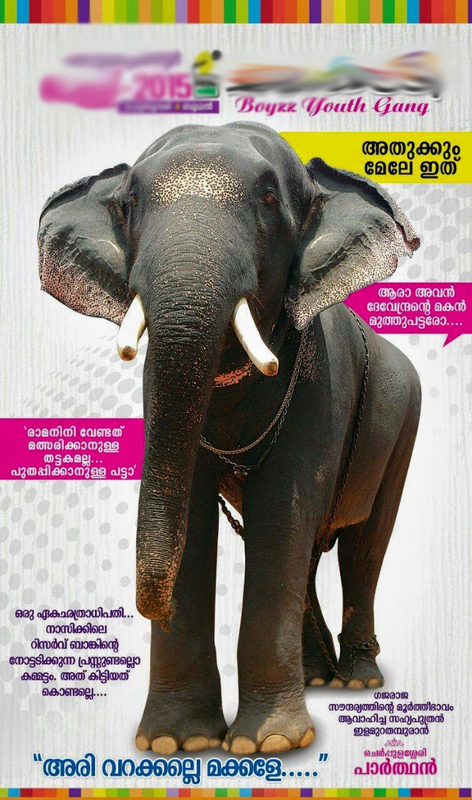 “Few years back, there were two classes of elephants in Kerala, namely timber elephants and festival elephants”, recalls Raj (name changed due to reasons), a mahout with a private owned elephant, and he continues, “but there are no such classes now, all of them are running from one festival place to other, meager earnings from timber yards are overlooked”. Strenuous working hours in timber yards were something that used to bother activists, and often violated the prescribed norms. Festival grounds have now slowly replaced those timber yards. With high demand and less number of elephants, no animal today is marked a timber elephant, or a rogue, or inauspicious and left out from work. A procession last week in Palakkad featured five tuskers, all of them hobbled, with mahouts armed with ankush flanking them, two of them even with spike chains on their forelegs. And interestingly all of them until few years ago were kept away from festival places due to their temperament and conspecific aggression. Elephants from northern Kerala, particularly districts such as Kannur, Kozhikode etc. were also never brought to central and south Kerala, considering the travel costs incurred, but not anymore. People who had given up keeping elephants have now joined the club again, years or decades later, mostly lured by the economics behind the scenes. Political outcries and public protests against a recent report by the Animal Welfare Board of India representatives serve ample evidence that the outcries are not about concern for the animal as is portrayed, but for the money involved in it. ‘Festival committees’ called ‘Scorpion Kings’ or ‘Thunder Boys’ do not sound like traditional or cultural ones, as is argued for its existence. In retrospect, I reminisce an old folk tale, long forgotten, about a sinking ark, where the survivors are trying to loot as much revenue from the ark, before it is completely sunk. And the folks of Kerala seem to overlook the fact that the state of elephants today, is yet another sinking ark, where with existing five hundred odd elephants, the ones involved are seemingly trying to make the best, before all this is erstwhile lore. The state lost a hundred odd elephants due to various reasons in less than half a decade, since the last systematic enumeration performed by the Forest Department. The numbers appear to have come down from 702 (2010) to about 550 odd (2014); thanks to the increasing work load, elephants in their prime (20-40 years of age) seem to be losing the battle, contrary to widespread beliefs that most animals do well in captivity. excellent chronicle of changing attitudes to elephants and how the economics of elephants as temple commodities works. Temple festivals have become brands and the core expression of the brand is the number of elephants in the brand/festival.